The Creative Commons license is sometimes a contentious designation in the world of art and creation. The type of Creative Commons license applied to a work further complicates the issue of copyright, fair use and commercial exploitation. For various reasons, I’ve retained the Attribution license on most of my Flickr photos . . . despite occasional impulses to batch change and render all images non commercial — or tack on a share-alike provision to engender a sense of cooperation along the lines of Open Source. A recent letter from an artist reminded me again of why I keep coming back to Creative Commons. 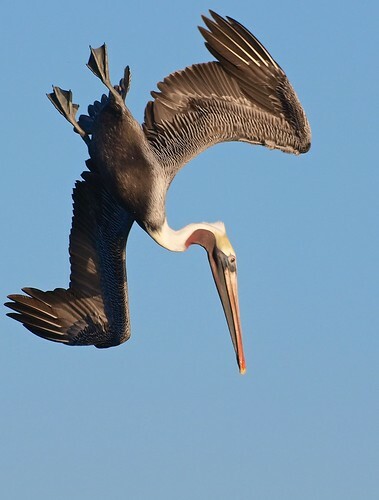 Dan Kent is a Miami-based artist who used one of my pelican images to illustrate a card — the proceeds of which benefit two wildlife organizations working with oil-inflicted animals of the Gulf: International Bird Rescue Research Center (IBRRC) and The Institute for Marine Mammal Studies (IMMS). Dan took this momentary capture and infused it with elegance and meaning in his ink and watercolor rendering of a Brown Pelican in a dive. The work itself is transformative in a pragmatic sense: pixels to ink. But it’s also regenerative for me, personally. A photo inspired by my beloved Brown Pelicans transmutes into art which, in turn, helps lift these birds from their undeserved fate in the muck of the Gulf. Dan writes more about his involvement with the project in a post about that very sketch: Diving Right In. That is the reason I photograph — and the reason I blog. They’re endeavors born of passion, to be sure. But it’s the positive ripple of any action that makes life work for me. And when that effect trickles down to benefit the animals and nature I cherish above all else, my gratitude is immense. “Each sketchcard on this blog is $10.00. The $10.00 is a donation to help the animal victims of the Deep Water Horizon Gulf Oil Spill. Every penny is donated. The two Non-Profits that are benefitting are The Institute for Marine Mammal Studies and The International Bird Rescue Research Center. Kelly writes more about her motivation and her initial efforts in her inaugural post, Be the Change You Want to See in the World. She’s running a Great American Illustrator month, where select cards are selling for a $50 donation to the same cause. The Gulf oil disaster (I simply can’t bring myself to call it a “spill”) is a tragic and bleak reminder of why organizations like IBRRC and IMMS exist. During disasters –and separate from them — wildlife organizations work constantly to rescue, rehabilitate and educate on behalf of the wild animals who don’t have an effective voice in the human world — but who often suffer the most as a result of our malice and mistakes. My thanks and appreciation to Dan Kent and the other artists who have contributed their gorgeous talents to create a bigger ripple on behalf of our earthly cohabitants.